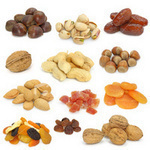 Nuts, Seed, Dried Fruits & Vegetables - DISCOUNTED! Great training treat! Banana slices are to be fed as a treat only and in moderation. A good, healthy treat, this premium dried coconut contains no additives or preservatives, and is not sweetened. Unlike most dried coconut on the market, our dried coconut chips are not treated with sulfites to keep them white. Human grade dried cranberries. Dried cranberries contain a high level of antioxidants. A good, healthy treat. Crantastic Crunch Per 1/2 lb. An awesome MySafeBirdStore custom blend. A great combo of shelled almonds and unsulfured coconut and cranberries. All human-grade ingredients make this combination a delectible treat! Almonds are a great source of Vitamin A. Cranberries contain high levels of antioxidants.Coconut is a great, wholesome treat! A fun treat for small to large birds. For smaller birds, it is suggested that you cut the pieces in quarters. Approximately 25-30 pieces in 1/2 pound. Chewy, flavorful diced papaya is great as a treat option for cage birds. Tropical flavor your bird craves in a morsel just the right size. This fruit is sulfured.